It all started when I lost my Jack Russell Terrier named Jack, back on July 15, 2012. Jack was 11 ½ years old and had a heart murmur. When he left me, he had hidden under my sofa and passed away quietly. Jack was everything to me and I quickly decided that I could never get another dog. The hole in my life that Jack left behind came with a heavy emptiness, and I couldn’t bear to feel that kind of pain and loss again. Eventually, my brother convinced me to volunteer at the local animal shelter. Though I wasn’t ready to adopt someone new, I love animals and figured the shelter could always use an extra hand. So in November of 2012, I started volunteering. Little did I know, I would eventually meet my special boy, Houston, a Staffordshire Bull Terrier. On November 3, 2013, Houston was brought into the shelter, and a few hours later I saw him for the first time. By now, my brother and I had been volunteering for a while, and spent most Sundays there. On this particular day, we had just finished our usual rounds taking out as many dogs as we could for walks and helping visiting members of the public. The shelter was closing for the day and as we headed out, we saw a brown dog in the kennel near the side door. He looked so sad lying on his bed, and as I looked closely, I saw tears coming out of his eyes. My heart went out to him, and I just couldn’t pass by his kennel. His kennel door did not yet have the usual card with identifying information. I pushed away my exhaustion and got ready to take him out even for just a little bit to help cheer him up. He was so well behaved. He knew commands for sit, down, shake hands, and he walked very well on the leash. We only had ten minutes together before the supervisor had to close up for the day. I brought him back to his kennel and headed home, but in those ten minutes, I had already fallen in love with him. I started coming to the shelter more often to see Houston and I made sure to spend time with him before and after every volunteer shift. I hoped that by spending more time with him, he would perk up and we would have a better chance at finding him a forever home. I found out later that Houston was one of at least 18 dogs that were dumped at Castaic Shelter by a con artist. This person represented himself to families as a trainer who specialized in re-homing animals for owners that could no longer care for their pets. He promised these families that he would first assess the pets to determine if they required additional training, then he would find them good homes for a fee. As soon as he had their money, the “trainer” dumped these animals at the local shelters. As far as I know, very few of these pets made it out of the shelter. As angry as I was at this terrible story, I focused all my energy in finding Houston the new home that he was promised. He was a gentle dog and always did very well with walking on a leash and interacting with everyone, humans and dogs alike. Houston also proved to be a great student. The shelter performs certain evaluation tests before put up for adoption and rarely hands out A’s. A dog must be extremely well-behaved and do well with others. Houston earned straight A’s and passed everything with flying colors. I was very proud of him and knew that he would be the perfect dog for the right family. But with every passing day, I worried that he would run out of time to find a new home, and that the shelter would eventually put him down. On days that I was not scheduled to volunteer, I checked the shelter website, worrying that they had decided his time was up and that I would not find his profile on the site. I felt a wave of relief each time I found his profile. Though it meant no one had come for him yet, it also meant he still had time to find his new family. I remember one particular family that came in and sat with Houston to see if he would be a good fit for them. They had young kids about seven or eight years old. Houston did especially well with children. The kids pet him, touched his ears and tail, and handed him many treats. Houston, in turn, was very gentle with the kids and loved the attention. He won over the kids and their mother, who immediately wanted to take him home. The father, however, refused to consider him because he was a pit bull, and that was the end of that. The family passed on Houston, and his search for a good home continued. 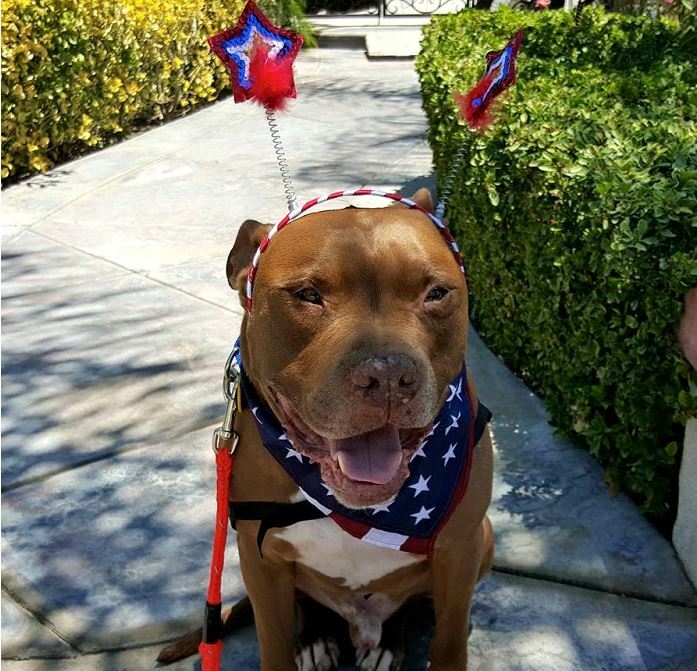 Unfortunately, because he is a pit bull, he did not present well to visitors at the shelter. Though he never growled or did anything to indicate that he was aggressive, he was a pit bull with a big and bulky body. People were immediately intimidated and assumed he was mean and unpredictable. As a result, people repeatedly passed by his kennel without giving him a second look. To the contrary, he loved people and any attention he could get. Though it’s already difficult for most shelter animals to find new homes, I realized that pit bulls face even more hurdles. I began working more and more with the many pit bulls at the shelter. I found that most just needed an opportunity, a chance to show how loving and loyal they could be. But it’s very difficult for people to look past the breed’s bad reputation. Out of fear, most do not give these loving dogs a chance. The realization that lovable and gentle Houston might not find a home because of this broke my heart. Another obstacle he faced was his age. At four, he was not old, by any means. However, most visitors to the shelter gravitated towards puppies or younger adults at about one to two years of age. No one was interested enough to submit even one application for Houston. I networked and shared his story with other senior volunteers as well as posted pictures of him on my own Facebook. I hoped and prayed that a family would come for him, but if a family couldn’t be found, I searched for rescues that might take him. I offered to foster him, which can only be done if a rescue first pulls him from the shelter. The search proved to be extremely difficult. 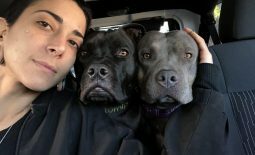 Most families were not willing to take a pit bull into their home, and many rescues were already bombarded with requests to save many other animals. 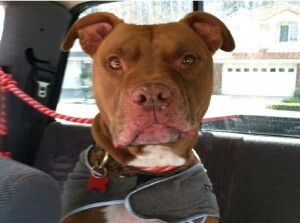 Other volunteers at the shelter had also fallen in love with Houston and his mellow personality. He was a volunteer favorite, and we all worked hard to find the right owner to come save him. But soon December came and his time at the shelter was up. He was scheduled to be put down after closing on Thursday, December 5, 2013. My brother and I couldn’t bear it. He was a special boy to us and we knew he would be a great addition to any family. He just needed a chance. Lynda, another senior volunteer, did not give up on Houston either. We continued posting on social media and sharing videos of his wonderful personality and all the tricks he knew. We continued hoping someone would get him out of the shelter in time. Lynda is one of the most compassionate people I have ever known. She spends most of her time networking for the animals and finding creative solutions to find them ways out of the shelter, either through rescues or other programs. When I feel I am losing hope, she always turns to me and says,“Kim, we can save them all! Keep trying!” I am grateful to have met her and have learned so much from her. She keeps everyone at the shelter hopeful and motivated. Lynda and I continued plastering social media and pleading with Facebook friends and rescues for Houston’s life, “He deserves a second chance!”, “He’s one of the volunteers’ favorites!” But despite our combined efforts, the morning of December 5th came, and no one had come forward for Houston. Finally, fate intervened that afternoon and Lynda rushed in and announced that a rescue had finally been found. The rescue wanted to immediately pull Houston from the shelter and enroll him into The Good Dog Ambassador program. They heard what a wonderful and well-behaved dog he was, and wanted him as an ambassador to represent and educate others about his breed. All that was needed now was a volunteer to foster him for the rescue. I immediately jumped up. I worried for a bit that I wouldn’t be what Houston needed. I had always had little dogs, and didn’t know the first thing about having a big dog. But Lynda and the wonderful people at the rescue walked me through the process of fostering. Within a few weeks, I decided to officially adopt Houston. My brother took a few days off from work to welcome him into the house and help him get situated. He told me that when he opened the door to bring him in, Houston’s big and expressive eyes were wide, happy, and grateful to see my brother. There was an understanding in Houston’s eyes, that he was safe and finally home. As soon as he came in, he calmly walked over to my parents and sat next to them. My other two little dogs immediately greeted him and loved him. I was amazed at how good he was and how easily he fit into our home. After only a few days, I knew that Houston wasn’t going anywhere. This was his forever home and he was family. I immediately finalized the paperwork to adopt him and it’s now been almost two years since he first came home with me. He has been such a perfect and loving boy. I can’t imagine my life and my home without him. I like to think that Jack knew how difficult his leaving would be for me, and that it was Jack that made sure my heart was open and that my path led to Houston. Though Houston can be quite the couch potato during the week, he loves going for long runs and hikes with me on the weekends. I am proud to take him with me everywhere because he is such a well-behaved dog. I want people to see how gentle and affectionate he is. 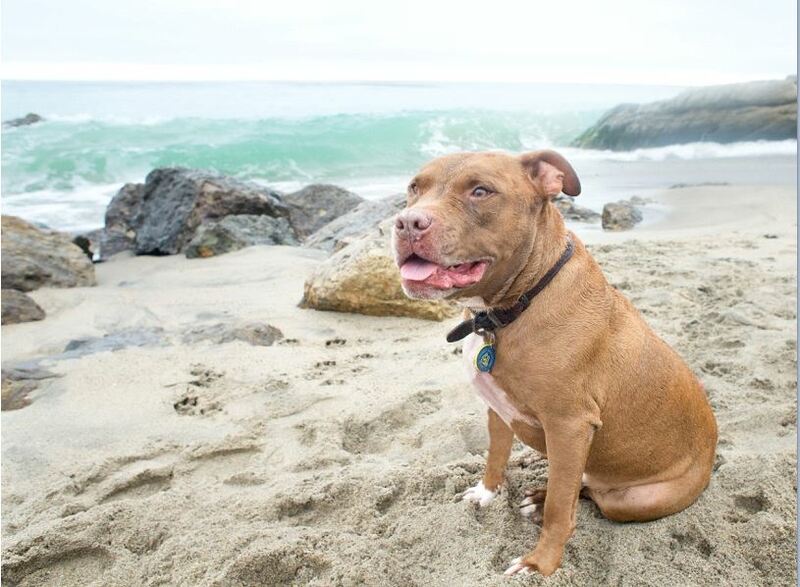 I know it’s a small step, but it’s a step towards helping people see pit bulls differently. Houston and I are now a part of the Los Angeles Responsible Pit Bull Owners (LARPBO) family.We regularly participate in meet ups and activities for LARPBO and it is the best thing to happen to me and my dogs. Though the group is largely made up of pit bull owners, it is not exclusive to them. I take all my dogs out to the events and we participate in many classes and programs. On April 6, 2014, Houston took the Canine Good Citizen test and passed on his first try. Now, through LARPBO, Houston takes dock diving and swim lessons. He also attends agility classes and loves the challenge of the obstacle courses. Troy, the founder of LARPBO, along with trainers Troy, Mariana, and Griffin worked with Houston and me through many advanced training classes to prepare for the Advanced Canine Good Citizen test. It took us a few tries, but with LARPBO’s help, we eventually passed this as well. LARPBO continues to mentor me in how to be a responsible pit bull owner as well as the best owner I can be for Houston and my other little ones. 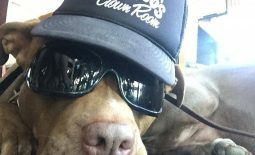 They are a wonderful network that allows me to learn more about the pit bull breed and they provide many opportunities to socialize and learn from others about becoming the best owner I can be. 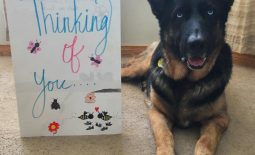 I recently researched details about therapy and service dogs and came across Loveon4Paws.org. Suni at Love on 4 Paws, assisted me in finding the best program for Houston. Service dogs are usually dogs with a job to do and, as such, cannot be pet while they’re on duty. Because Houston loves getting hugs and getting pet, I decided becoming a therapy dog would be a better match for him. So we signed up for LoveOnPaws’ orientation May 23, 2015, and continued our regular advanced training through LARPBO to prepare for the test to become a therapy dog. Of course, with his gentle and easy going personality, he passed this test as well. 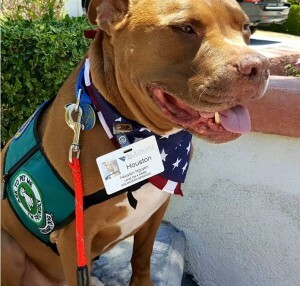 He now volunteers as a therapy dog at St. Vincent Medical Hospital in Los Angeles. He loves people and easily brings joy to many with his wagging tail and happy expressive face. I believe it is Houston’s turn to train people and change their views about pit bulls. My hope is that through his good nature, he will help bring about a better future for his breed. Please visit your local animal shelter, look past the breed you see, and connect with the dog. You never know what amazing joy each animal can bring into your life until you give them a chance! Please adopt a pit bull and give them a second chance at life! Click here to follow Houston’s story. Frannie: How Did this Happen? Miles Woo: So You Think My Dog is Good?